So here they are the first of my wedding posts (there are quite a few more to follow!) When I start to gather everything together I realise just how much we managed to achieve especially as it was such a hand made affair. I can't take full credit for everything my little sister was an absolute angel, she's a graphic designer which not only saved us a fortune on design and printing but we were able to have invites with a really personal touch. The theme for the wedding was colourful, I love colour too much to have narrowed it down to just one and this was reflected the whole way through. I used vintage sweet bags to put the invite and information packs in, wrapped with a lace bow and small luggage label (with names on). Its a shame people didn't see them when they were all stacked up as they looked so pretty. I used a mix of purple, pink, yellow and coral bags with contrasting coloured lace ribbon (all brought from ebay). 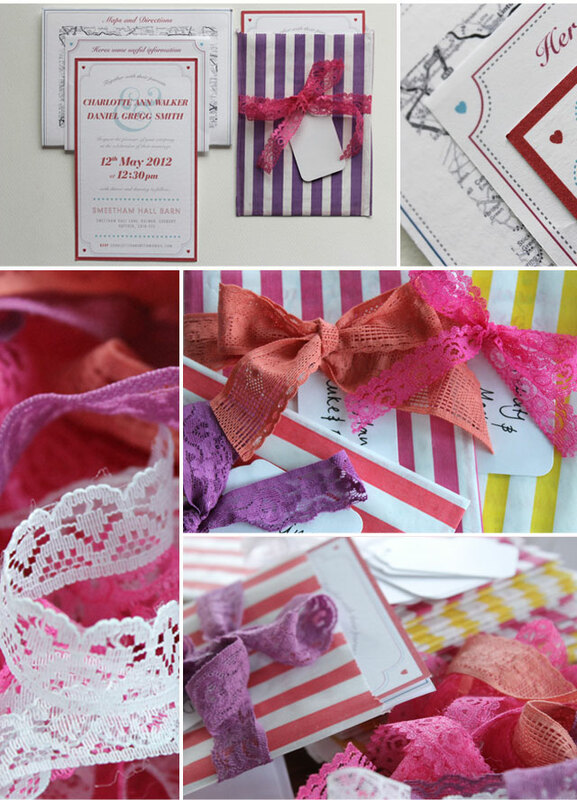 I brought good quality card stock and envelopes from here, which set the colours used on the invite off beautifully. I have to admit I added the final details in the last few weeks before the wedding, I definitely wasn't a six months in advance bride. 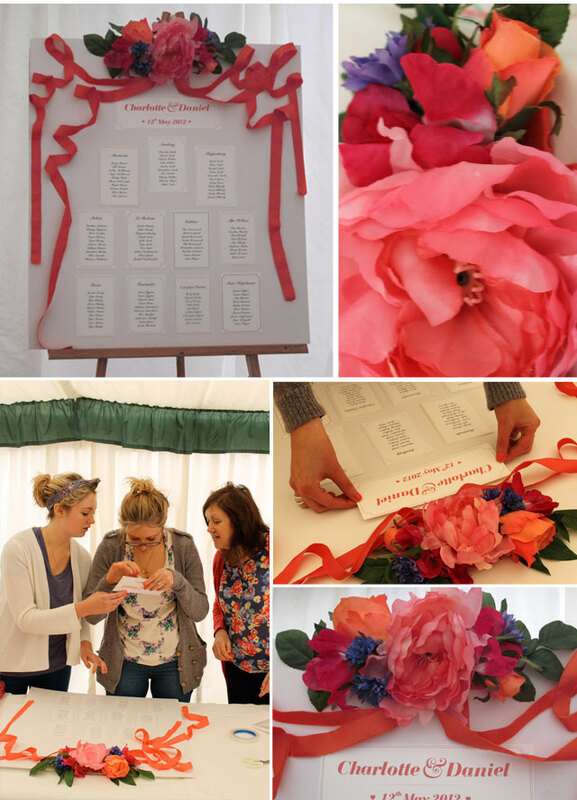 The table plan was no exception, here we all are putting it together the day before. I made the floral top piece using fake flowers from Ikea (they were quite expensive and I think I could have brought cheaper) but the colours matched and I was running out of time. I made the flower piece separate from the main board and assembled at the venue to limit damage in transit. It was quite easy to put together, but let me know if you would like a tutorial or me to make you one. I love how it turned out, the ribbon (which I used for the flowers and the cake too) cascaded around the board giving a gorgeous 3D effect. The day was quite long so we wanted to introduce things to keep the day flowing. 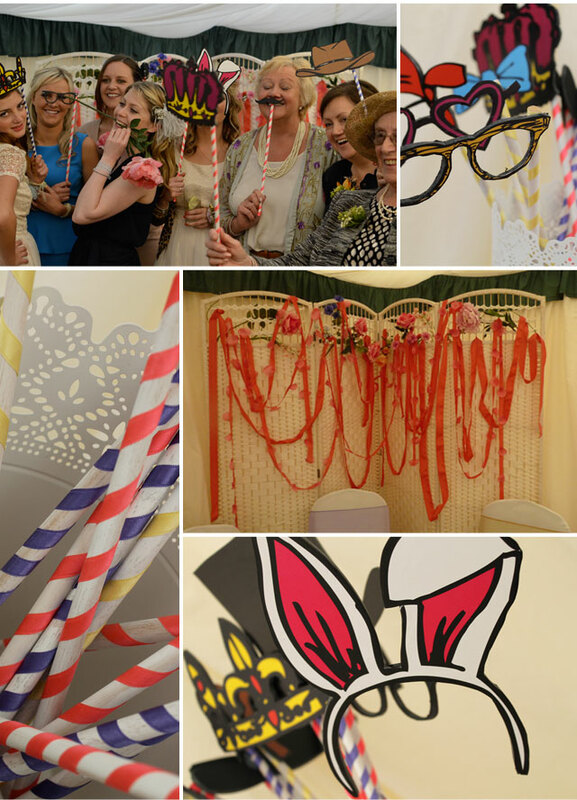 After the Wedding Breakfast we decided to have a cocktail bar to keep things lively and to accompany it a photobooth. These seem to be a given at American weddings but here in the UK I think they are only just gaining popularity. I printed the props from the amazing Oh Happy Day! and added them to ribbon striped sticks to match the sweet bags. The were a huge success and kept the good mood flowing. I was really lucky as the venue had a perfect screen which they let me borrow I then added flowers and ribbon to the top. I hope you liked Part 1 I have already loaded a few other details, here, here and here. I haven't even started on the flowers yet so make sure you come stop by again to have a look, they are a-m-a-z-i-n-g! I've never seen such a pretty table plan before! Those colors are beautiful and the ribbon really does add so much! Nicely done! Thanks Amberly! I want to use that ribbon idea on more things I love it!